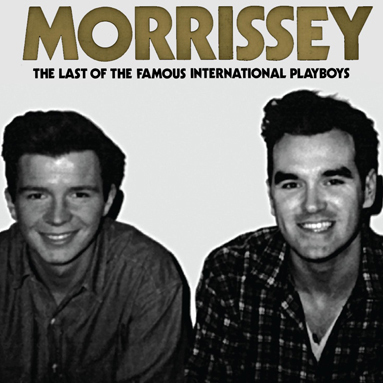 Last month Morrissey announced he was going to use a unknown photo of him and David Bowie for the reissue cover of his single "The Last of the Famous International Playboys", well that didn't sit well with Bowie (or his lawyers who really knows) so he told Morrissey to not use it. Well it looks like Morrissey went digging through his drawer of famous photo bombs and has come up with a pic of him with Rick Astley taken backstage at a 1989 TOTP appearance…to be honest it's a great picture, Morrissey actually looks happy, so maybe it all worked out for the better. To my friends at Pitchfork, the song in question is not called "The Last of the International Playboys"…for next time.